Confused about the next step after completing BCA graduation? Of course, it happens owing to the fact that you have just stepped out as a fresh graduate with a plate full of opportunities and options served in front of you. At Marwadi University you get a lot of options to pursue further studies or jump into a new field, and this time we have good news for the BCA graduates with a chance to pursue MCA degree in one of the best MCA colleges in Gujarat. In order to pursue this course, it is of utmost importance that you get thorough knowledge about the MCA degree. And Marwadi University is here to help you in that case, read further to get a complete view of how to hop on to this course and all the details in it. MCA or Master of Computer Applications lays its focus on building a bridge between the students and current trends and global condition in the application development field to impart them the practical knowledge to build on the dot applications. Marwadi University realized this core of MCA and has brought through the syllabus in order to enhance and polish student’s knowledge to make them ready for developing interactive applications in the real world. Why Marwadi University for MCA degree? 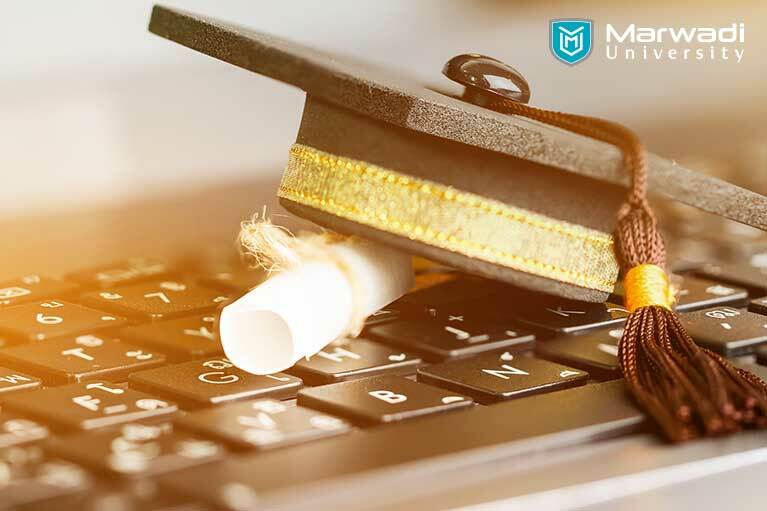 Being a leading MCA college in Rajkot, Marwadi University has some virtues to be imparted in the MCA degree that includes building a strong foundation about the computer knowledge among the students. And theoretical knowledge is accompanied by practical and analytical lessons to deal with daily life situations. Marwadi University aids the students with the best and latest technical knowledge and adequate information. There are mentors proficient enough to impart detailed knowledge about the application development process right from designing to development. MCA degree curriculum at Marwadi University includes lots of workshops and sessions with professionals to get insights about the work done in the actual industry for handling real-time requirements. The facts on which Marwadi University claims to be the best MCA college in Rajkot are too many to list out but here are a few points that cannot be ignored. After acquiring the best knowledge, the question often arises about the future, what will be the opportunities that one will get, how will one be able to find the correct job and even there is a dilemma whether an MCA degree holder will get a job or not. We assure you that there are a lot of opportunities waiting for you to grab and build your career. Besides these employment opportunities in the Banking sector, E-commerce, and multiple sectors are also possible. And as Marwadi University is one of the best MCA colleges in Gujarat, the placement cell is efficient enough to bag the best jobs tailored to their knowledge and area of interests.